Horsemen of Arkansas have sponsored the AQHA Trail Challenge scheduled June 1, 2013 in Hartman, Arkansas. The Trail Challenge will be governed by the AQHA rules and the rules of the American Horsemen Challenge Association. A family oriented event, the day will begin with a brief benefit for the Special Olympics followed by a walk of the trail immediately before the competition. It has been reported to us the ride will have several levels of competition from youth through a legacy class for those over 55 years old. Coggins papers for in state horses plus health papers for out-of-state horses are required. It is guaranteed to be a whole lot of fun. If you live in Oklahoma, it may be about the closest AQHA sanctioned competition around. Looking at the schedule for 2013, there doesn’t appear to any in Oklahoma for the remainder of the year. Horsemen of Arkansas sounds like a down to earth, laid back group of horsemen who know what they like to do and have a good time in the process. If you want more information, go to the web site at the link above. Our Summer Intern Program teaches more than just horse skills. We recognize the need for students to learn the importance of the good work habits and see the intangible qualities needed for a successful career. For example, we don’t accept interns into the program without a resume. Some ask, why do I have to turn in a resume, “I don’t have much experience anyway.” The answer is because resumes are part of the work world and it is never to early to start learning. Most companies hiring a candidate require a cover letter and a resume so we do too. While our interns have a lot of fun and don’t spend the Summer cleaning stalls, there is a level of responsibility required of them. Sure they learn the horse handling skills and spend a lot of time in the saddle, but we also want to make sure they understand the importance of punctuality, integrity, courtesy, and the day-to-day communication aspects of the work place. The time they spend with a professional horse trainer and the benefit of his years of experience is helpful for sure and yes they always pick up some tips on how to do things. But for the most part, we hope they also see the significance of those qualities we believe make for success; hard work, continuous learning, keeping your word, and taking responsibility for your actions. Without these, the greatest horse trainer in the world isn’t worth squat. There’s a lot more to success than just being good at getting a horse to do something or possessing a special gift or talent so you get called a “horse whisperer”. At the end of the day, if you can’t do it with honor, respect, and decency, it’s not worth doin’! AQHA has posted a Trail Challenge Schedule for the remainder of 2013 for those interested in having some fun and enjoying some friendly competition with fellow horsemen. There are competitions all across the country so if you want to give one a try, check the schedule for one close to you. Recently Jack had the opportunity to help another neighbor. Sure sorry there isn’t photos or video to show you this one! The neighbor draws water from a small lake near his house using a pump. The pump burned up unfortunately and had to be replaced. Not exactly the end of the world, but it took some work and effort that was rewarded with no water when the power was turned back on. A closer inspection revealed the pipe leading into the underwater pump had broken due to age and the new installation. It had to be repaired in the water or it meant pulling the entire unit back to shore. The neighbor waded out to do the work, but was up to his chin in the water (still pretty chilly in May). In order to splice the joint, it had to be held out of the water for ten minutes in order for the glue to bond to the new pipe. The neighbor just wasn’t strong enough to stand there in the cold water up to his chest holding the pipe at head level to dry. Well, Jack, as he always seems to do, came to the rescue. The rider (who will remain anonymous to keep the mental health people from finding him – LOL!) stripped the saddle and pad from Jack and donned a pair of shorts after taking off his own boots and jeans. He rode Jack into the lake up to his neck in the water and placed the pipe on Jack’s neck. This remarkable AQHA quarter horse patiently stood there the full ten minutes with the pipe near the top of his head, neck-deep in the water while the glue dried. Jack then lowered his head so he could back up without breaking the pipe as he exited the pond. This is one truly amazing horse! Jack the rescue horse is now Jack the plumber. Spring is here and so are the bicycle riders. PJ came across bicycles three times this week and we were pleased at his response. The first bicycle was a mountain bike with a single rider. He went past and PJ just looked at him. It is always interesting to see if a horse has more concern over one rider or a group of bicycles. Later, about 30 bicycle riders in a group wearing all sorts of bright neon colors and sunglasses came flying past PJ from behind. Again he just turned to look, but never missed a step. A short while later, this same pack of riders apparently turned around and came at PJ from the other direction. He just watched as they sailed past without more than a passing look as to say, there are those pretty colors again. PJ has an eye for fashionable colors for some reason and is always interested in how others are outfitted. We like to see the bicycles out as it gives training events that are difficult for us to artificially create. As you ride over the top of a hill along the road, a large group clearing the top of the hill from the other direction can create anxiety or scare some some horses until they become acclimated. PJ is coming along well with his training and never showed any fear of the bicycles. 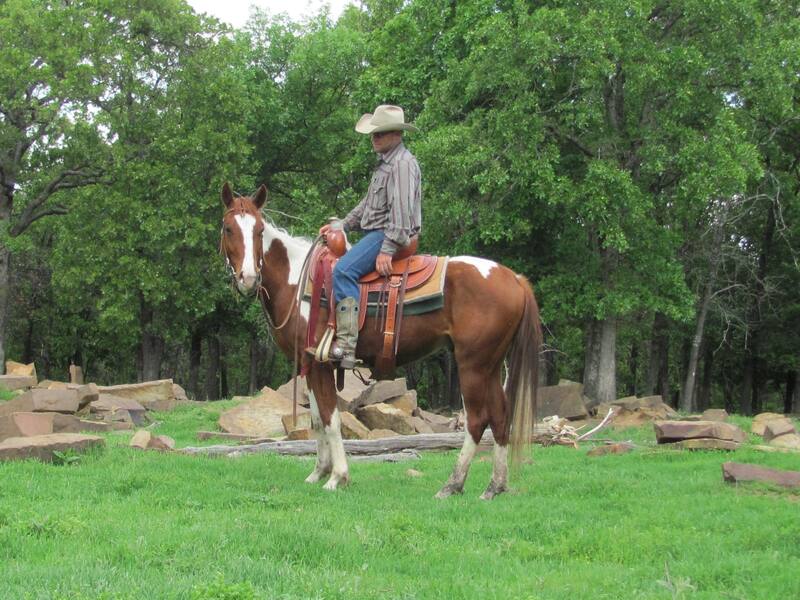 Last year we purchased a nice AQHA stallion we felt was a real bargain. He was on the fast track to a successful career when he injured a hind leg. The previous owner felt he would recover and successfully compete. We liked his blood lines, attitude, and athletic ability. So we bought him to breed to some mares we have. We changed his barn name to Colonel. Little did we know just how appropriate this rank would be. 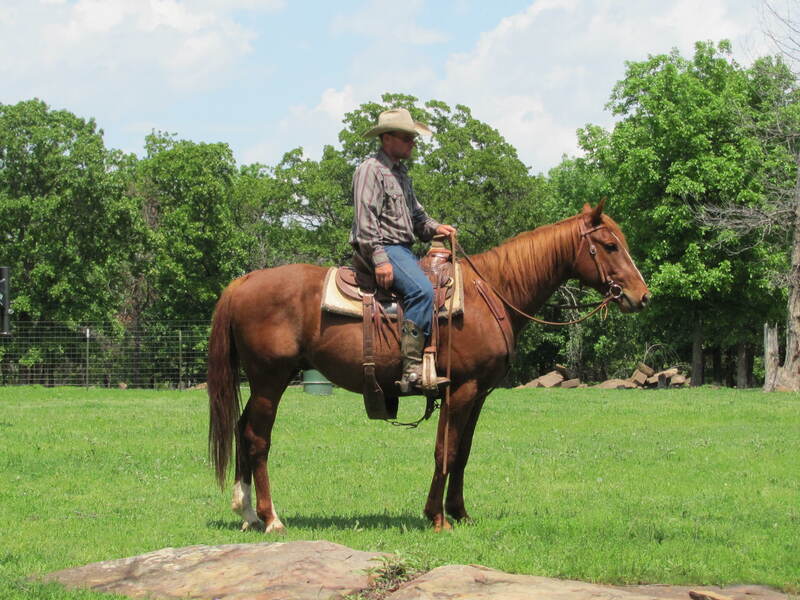 He is usually pretty easy to handle and is routinely ridden around the ranch as well as off the place. We have no plans to send him back into reining. The leg healed completely, but he is just too nice a horse to spend his life spinning circles in a ring. The other day we went to worm him and the mares in his paddock without a second thought. The mares were all easily caught, tied, and wormed. Colonel just happened to be last and no one expected what came next. All the training given him suddenly left his consciousness and Colonel decided he didn’t want to be caught. Yep, we also have these issues every once in a while just like everyone else. Colonel was driven into a catch pen where there was less room to run and could be more easily caught. Much to our surprise, he jumped the fence. It measures 52″ to the top and he flew over it like a bird. He is an athletic animal and now holds the rank of a Full Bird Colonel! Story ended well, we caught him about 15 minutes later, let him settle for a minute, and completed worming. Maybe when we have a little more time, we’ll work on learning to stand instead of flying. Moral is when you go to change a horse’s barn name, be careful what you call him! There’s a real misconception in the public about rescuing horses to be rehabilitated. I have done both rehabilitation of horses as well as training. It is vastly different and much akin to high school algebra. Simple mathematics when you stop and add it all up. If you take the typical 9th grader and set out to teach him or her algebra, it’s not too hard. Assuming they come from an average family, completed the normal course work in grades 1 -8, you shouldn’t have any difficulties generally speaking. Contrast this child with a kid from an abusive situation, who rarely attended classes, and paid no attention when he was there. He has no training, no confidence, and has been beat down in life by the circumstances in which he has lived the past 13 – 14 years of his life. Anyone can understand and accept the second child will probably encounter a lot more difficulty learning algebra. If I said you might even have to teach some completely non-math living skills before you moved to basic math, no one would question why it might be needed. If I said it might take two or three years to teach the abused child algebra because the background and foundation wasn’t there, probably no one would question what I was trying to say. But when I try to say that rehabilitating a horse is not the same as training, some people don’t follow what I tried to explain. You see a shattered horse is like an abused child. It may take years to build trust, confidence, and acceptance before you can go to work on what I would call training. Sure the rehabilitation is “training”, but it’s not the training I would give a horse that is a “clean slate”. If you haven’t worked with an abused horse and understand what I am trying to say, then please be careful when you go to “training” the rescue horse you just saved. I always hate it when I hear the horse someone just saved stomped on their face and knocked out their teeth. Like people, a troubled horse is a lot more complicated than one that has received proper care. It as simple as high school algebra! Polly is a registered solid Paint. She’s a nice filly that has been ridden here at the ranch for about six months. She came as a bit of a surprise. While we made sure to verify she was registered, we didn’t look at her blood lines and pedigree. 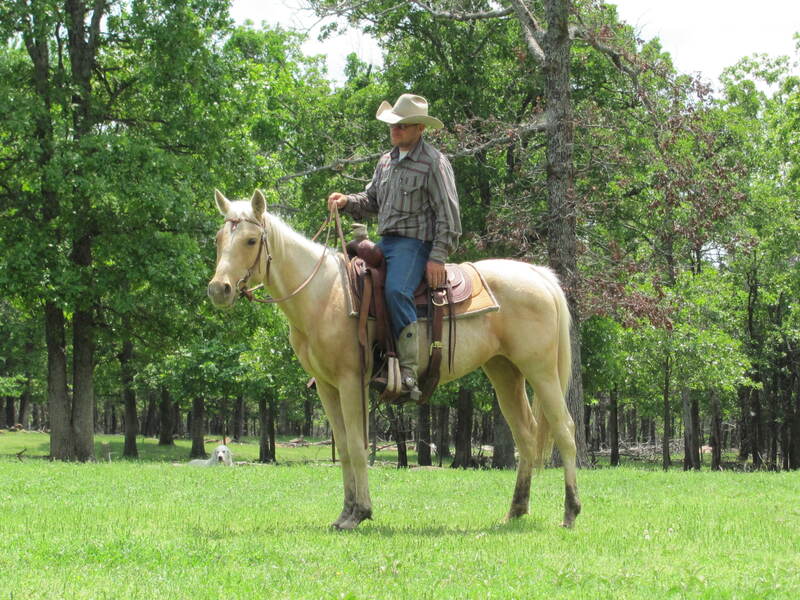 We liked the Palomino color, the classic quarter horse confirmation, and the attitude we observed. She had not been ridden so that was a plus for us (no problems to fix). Thinking she was AQHA registered, we were surprised to see the papers. Oh well, things happen and sometimes for the best! This is a good lesson if you are looking to purchase a horse. Ask a lot of questions and don’t assume things. The responsibility is just as much the obligation of the buyer as it is the seller. Here we liked what we saw and just failed to ask where she was registered. It’s a good reminder for all of us. This deal worked out really well anyway. We ended up with a good horse, just a different registry than we thought. She’s a pretty little filly that is learning fast and doesn’t act like some of the Paints we have run across. Polly is sound, smart, and going to make someone a good horse. If you like a Palomino, you better check Polly out! The Bad Girls Trail Riding Club announced the 18th Annual City Slickers Trail Ride is set June 8, 2013. The ride will take place at Walnut Creek State Park, Prue, Oklahoma, the beautiful Lake Keystone area. Registration is open to everyone and at the very affordable price of $10.00 per person with children under 12 free. The ride heads out at 9:00a.m. Bad Girls Trail Riding Club (“BGTRC“) is a ladies trail riding club started by three ladies wanting to combine their love for horses with quality time with their friends. The group’s web page shows they are actively engaged and have a great time together. If you want more information about the ride click on the link above or contact Ms. Carla High (918)857-2585 or Cmhight1@peoplepc.com. Sorry to burst your bubble and no offense to Clinton, but thinking you’re going to watch some videos is going to make you a horse trainer is almost as funny as opening a surgical practice after watching a season of E.R. or House. You know the television shows about doctors and medicine. Granted you can learn things by watching videos, but you are not likely to develop the skills attained by someone who has spent the last 25 years working with the equine species. Clinicians like Clinton Anderson are trying to educate, but we seriously doubt he would tell anyone to watch his videos and read his books once or twice and then open a horse training facility. Nonetheless, we hear exactly these type operations starting up with novice horseman going into the training business. We don’t mean to bash the competition as it were, but we like to think our two-year training program offers a little more to a horse than 60 days “training” by a recent clinician proselyte. The next time you talk to someone who wants you to believe they know a lot about horses and are carrying in their hand the “magic” rope or halter or whatever they just bought from an expensive clinic, stop and listen to what you just heard. There are no substitutes for experience, hard work, and “wet blankets”. You don’t teach your child to play the flute or the trumpet by watching a handful of DVDs and there’s no special instrument you can buy that will make them an overnight success. It’s not rocket science to train horses, but it may take a little more than a couple of weekend clinics to learn how. If it were as easy as some want to make it, then we wouldn’t have a market for our horses when they finish the two-year curriculum we give. Oh yeah, and just to make sure we weren’t mistaken, we just put a new colt in the barn all last week with the DVD player goin’! Four of the AQHA registered quarter horses successfully completed the two-year training program this month. It’s a credit to them as others failed along the way or didn’t have the qualities and attributes necessary. Pete, Jack, Speck, and Doc all have fulfilled our requirements and met the expectations we set for those that finish the two-year trail horse program. Does this mean their training ends? Nope! We believe horses like people should be life long learners. You never know it all and when you think you do it’s time to quit! Horses need to keep learning as well. If nothing else, the horse needs to better learn the rider’s needs, wants, and desires. Good communication with a horse and rider comes primarily from a good fit and practice. Even an experienced horse can suffer occasional miscues and an experienced rider can poorly signal what he or she wants to happen. Does finishing the program mean these horses are absolutely bomb-proof [See 6/15/12 post for definition] and an accident can never happen? No, we don’t rule out rider inexperience as a catalyst for accidents. And anyone who guarantees what their horse will do tomorrow is lying to you. No one can honestly guarantee a horse will never spook depending on the circumstances. So what does completing the training really mean? First, the horse has seen “lots of wet blankets” meaning the horse has been ridden almost everyday by a trainer focused on developing calm, quiet, horses ready to work for two full years. They are taught to come quickly back to a relax state if excited. Second, the horse has been ridden by several different people with less experience to see how he reacts to different personalities and riders. Third, he has been exposed to livestock, semi-trucks along the highway, heavy equipment while it is operating, tarps, ropes, plastic bags, hikers, deer, coyotes, dogs, rolling balls, and all sorts of materials being dragged behind him to make loud noises. He knows how to stand tied patiently, load and unload, lead, neck-rein, stop, lope, trot, side-pass, back, stand hobbled, cross water, go up and down hills at a walk, step over logs and obstacles, pony other horses, and do more ranch chores than we can list. The horse has been used extensively and knows what it means to work. He is sound in mind and body. His feet are good and have been tested by use on our hard, rocky ground. What are these horses ready to do. They are ready to immediately use for ranch work, trail riding, play days, search and rescue operations or move to focused training for rodeo, barrel racing, western dressage, and other events. With all the foundational work done, these horses can quickly be adapted to a number of specialized uses. We are pleased with these geldings and proud to show them as graduates! They have all done really well and have the records to show their progress. If you have any questions or want to see what they can do, let us know. You don’t find this type of horse just anywhere. Should I Call The Vet If My Horse Gets Hurt? A few days back, we read a post written by a horsewoman equating her experience in parenting children to horses. The concept is a good one. The question she posed was, how do I know when to call the vet. New horse owners are a lot like new parents. They see something that doesn’t look right and grab the smart phone to look up the illness or disease. Often the result is a web page saying the problem is fatal or at best extremely serious. They quickly call the vet and three hours later and a few dollars lighter, the horse is fine and there’s not even any medicine to give it. The question on when to call the vet can be tricky. Just like a new parent, if you don’t call and the child dies, it’s your fault. By the same token, running to the pediatrician every time the child sneezes gets you labeled as a worry wart mom. Usually a little experience and pretty soon you hit that middle ground and everything goes fine. Horses are like kids, there’s no way to always know when you need to have the vet come out. It helps a lot to have a good vet who genuinely cares and doesn’t mind answering an occasional question by telephone. Still the right answer as to when the vet is needed is a moving target that is sometimes hard to hit. Just this week we had a horse kick and end up with his leg stuck in the fence. If the situation hadn’t looked so bad when we first found him, a picture would have been worth a thousand words. He had a lot of blood on him and was quite unhappy with his leg hung up about four feet off the ground. Still don’t know how he got there, but as any experienced horseman will tell you; horses can get into some pretty unusual situations. Did we call the vet out? No. Why not? Well. the first step we take is to sort out the problem and see how serious it is. We don’t normally call 911 when a child falls off a bicycle so we don’t call the vet until the situation is under control and the seriousness evaluated. In this case, removal of the horse from the fence was the first priority and then looking him over to see how bad things really were. Just like the child on the bicycle, the blood can look a lot worse than it really is sometimes. Fortunately, for us the large areas of blood came from several small places where he kept poking himself against the fence and it looked worse than it really was. When you question whether to call the vet, use your best judgment based on what you know and don’t look back. Will you always make the right choice, probably not. Could you make a mistake and your horse die? Sure. Is this likely to be the case, probably not if you are using common sense and trying to do the right thing. If you are a new horse owner or thinking about becoming one, try to find one or two people who own several horses that you can call with questions. Like a new mom who calls a few friends or her own mother for advice, having someone knowledgable to ask once in a while can give you some peace of mind. The bottom line is do the best you can. If it appears to be more than you are qualified to handle, get some help and assistance. If you call the vet out and he laughs and smiles, learn from the experience. We assure you that the decision as to when to call the vet is best answered in hindsight every time you have to make the decision. You are currently browsing the horsesfortrail blog archives for May, 2013.